My eleventh stadium of 2012 was on Saturday 14th April at the Memorial Stadium in Horfield, Bristol. 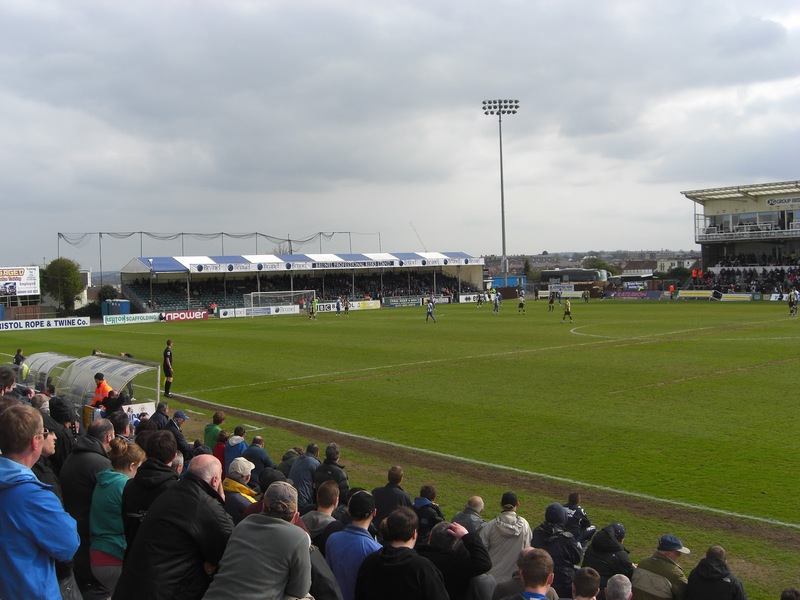 The match was Bristol Rovers vs. Burton Albion in Football League Two. 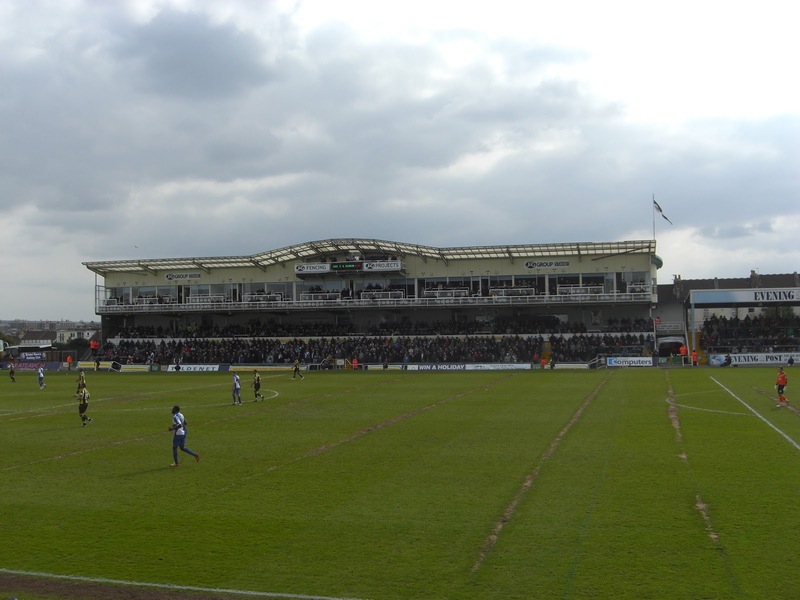 The Memorial Stadium is nestled in a residential area in the Horfield area in the north of the city of Bristol. The nearest railway station is Filton Abbey Wood which is 1.7 miles away. 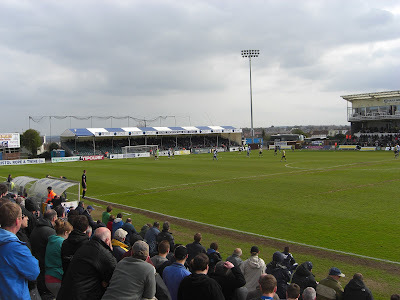 The ground has been home to the club since 1996 when they moved back to the city after spending a decade playing in nearby Bath. Prior to this Bristol Rovers had played at Eastville Stadium for 89 years up until 1986 when financial difficulties forced them out. The Memorial Stadium itself was built in 1921 and was primarily used as a rugby venue until the football club moved in. Despite a capacity of nearly 12,000 the stadium has just 2,500 seats split across three separate stands. The 1,060 seat Uplands Stand was built on top of a terrace in the late 1980s and looks very tall compared to the rest of the ground. 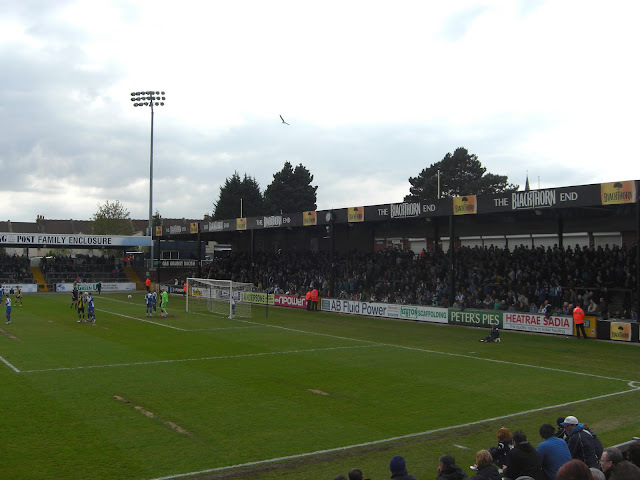 The stand is level with the half-way line and takes up around a third of the north-eastern side of the venue. The rest of this side of the ground is uncovered terracing which sits to the left, right and in front of the Uplands Stand and has a capacity of just over 2,300. On the opposite side of the pitch is the DAS Stand, a dramatic structure that looks more like a cricket pavilion than a conventional football stand. This stand contains 710 seats and like the Uplands Stand has terracing in front of it with room for a further 1,100 fans. Next to the DAS Stand there is the small Family Terrace stand which adds another 720 spectators to this side of the ground. Behind the goal at the south-east side of the ground is the South Stand, an all-seater stand which can place just over 1,000 supporters. This was initially erected as a temporary stand and has no less than ten stanchions holding up the roof meaning that almost all the seats in this area will have their view partially blocked. 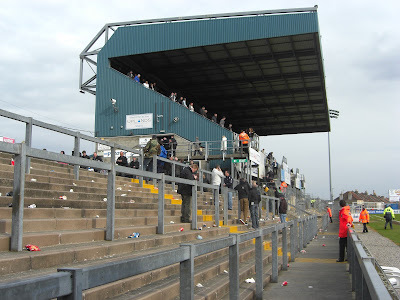 Behind the opposite goal is the Blackthorn End, a covered terrace where around 3,700 home fans can watch the match from. The game was a drab affair during a poor first half where neither team showed any real invention and with half-time approaching it looked like it would be a goalless first period. However, in the 39th minute the game sparked into life when Burton's Jimmy Phillips rounded the goalkeeper and when presented with an open goal managed to hit the post with his effort. The visitors were punished for not taking this opportunity just a couple of minutes later when Mustapha Carayol unleashed a speculative 25-yard drive which fooled Ross Atkins in the Burton goal and ended up in the back of the net. It took just 12 seconds of the second half for the hosts to double their lead when Burton defender Ryan Austin completely missed the ball with his attempted headed clearance and Eliot Richards snuck in to poke it into the goal. In the 54th minute Calvin Zola's looping shot from close-range pulled a goal back for the visitors but on the hour Rovers regained their two-goal lead as Matt Harrold converted from the penalty spot after Eliot Richards was felled in the area. Shortly after Jim Paterson added a fourth when he steered the ball into the bottom corner from 12 yards out to put the home side in control. In the 75th minute a deflected Matt Harrold shot from the edge of the box made it 5-1 and less than a minute late it was 6-1 after a terrible mix-up between Burton goalie Ross Atkins and defender Nathan Stanton saw them collide and allow Eliot Richards to tap home into the empty net. The scoring was completed in the 81st minute when a deflected shot from Eliot Richards allowed him to complete his hat-trick and ensure Bristol Rovers ran out 7-1 winners.